Click here to learn more about School Library Journal. 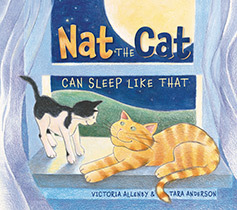 Pajama Press is pleased to announce that Nat the Cat Can Sleep Like That, written by Victoria Allenby and illustrated by Tara Anderson, has won the 2014 Preschool Reads Award. “…Allenby and Anderson have captured a cat any young ailurophile will recognize. The simple rhyming text listing the odd (yet realistic) places Nat can sleep during the daytime and all the silly mischief he and his black-and-white kitten sidekick get up to at night will hook young listeners. The watercolor, acrylic and pencil illustrations of floppy, goggle-eyed Nat and his buddy are a just-right pairing. But it’s more than a bedtime story: it’s a tale of friendship and acceptance. It’s a story in which kids safely explore relational differences and boundaries through the eyes of cats. “The rhyming word choice is spare in this delightful picture book for younger children, and deliberately so….Tara Anderson’s illustrations are whimsical and fun… Although the illustrations complement the story, they also tell a story of their own, encouraging children, and their grownups, to read the story again and again. Click here for full reviews. You can also download Nat the Cat Can Sleep Like That worksheets to help kids learn about prepositions and rhyming. This rhyming story has a playful tone, great for reading aloud to preschoolers. The adorable illustrations by Tara Anderson, rendered primarily in pencil crayon, will appeal to the target audience a great deal, and may even inspire them to try their hand at similar drawings. The onomatopoeia in words like “whoosh,” “shush” and “hush” further add to the light heartedness of the book, and will be fun for kids to imitate. Click here to learn more about Chirp.